Kiefer Sutherland is incredible in this suspense political drama about a l low-level Cabinet member who becomes the President of the United States after a terrorist attack that kills the entire US Leadership. Where can you stream Designated Survivor? On 2016-09-21 Drama/War & Politics TV Series Designated Survivor first aired on ABC. 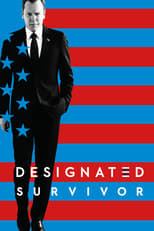 Written and created by David Guggenheim, and produced by Genre Films & ABC Studios, Designated Survivor will return and was last broadcasted on 2018-05-16.